Freedom begins from the double barrel of reason and passion! A few writings have changed humanity and Common Sense is one of them. Were Common Sense not written, most probably America today would still be languishing under the political yoke of Britain. Neither a sane nor an insane individual had ever said a word of American independence before Common Sense was written. It jolted the American people into action for freedom and independence from Britain rule. 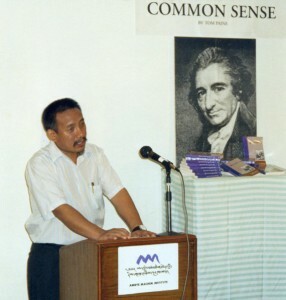 Thomas Paine’s little pamphlet Common Sense is one of those books that changed the world. Like The Communist Manifesto, or The Origin of Species, it had the effect of altering men’s minds with consequences that were far-reaching and long-lasting. No one could have predicted such a work from the pen of Paine, who had come to America only in 1774 at the age of 37 after a very undistinguished career in England. He was a born propagandist, however, and the cause of American independence fueled his imagination and inspired his writing. Of all the thousands of political pamphlets that have been forgotten since the invention of printing this is one that has survived. Written as an ephemeral tract, it has remained one of the important documents of American history. Mila, thanks a lot for this review. Great post on Thomas Paine’s landmark work. Tibetans should read Common Sense. Where can one get the Tibetan translation? Is it online? Thanks Mila for writing this analytical and thoughtful piece. I’m putting the link to this article on Facebook. Contact Lhasang Tsering by physical mail, he is not connected to the internet!, or email Amne Machen Tashi Tsering. SFT is setting a great example to other Tibetan NGOs by giving grassroot leadership training to its members in various fields. Twenty years ago there was only one guy in TYC who could handle media well enough! He didn’t have any such training! And he was one of the executive members! When he was hospitalized during a protest, every other executive member was backing off from the media mike! Blink! Blink!